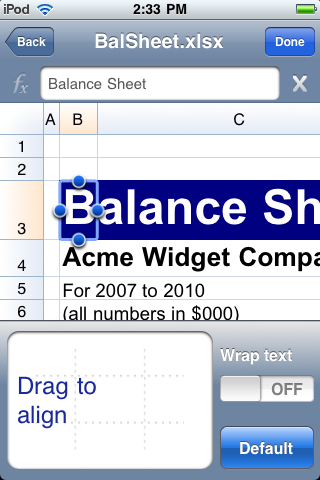 Quickoffice Connect™ Mobile Suite is the FIRST and ONLY full-featured Microsoft® Office productivity suite for iPhone® or iPod® touch with integrated access to multiple cloud services; MobileMe, Dropbox, Google® Docs, and Box.net directly from your iPhone or iPod touch. You can have continuous and convenient access to your same content across multiple devices, such as from office workstations to home computers, laptops, iPhone or iPod touch using your existing user account. Access remote content and share edited files via email or return your content to remote cloud storage accounts. Try out full editing of Microsoft Word documents and Excel spreadsheets before you buy with our free Quickoffice Connect application available iTunes Productivity category. - We do not charge a seperate subscription fee to use our application or to access cloud storage service providers with our Quickoffice Connect™ service in this current version. Your third-party credentials are also kept private and not stored by us on our servers. 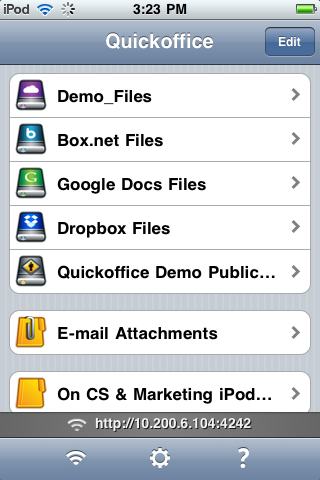 - This Quickoffice product is optimized for iPhone and iPod touch devices. A separate iPad product will be released soon.